One of my dear friends, Cathy, picked me to follow along on a sort of "Chain Blog" -- challenging me to find and share my most popular blog post in its nearly four year history. Has it really been that long!!!? The following blog post from March 2, 2012 has been reprised here, because it was my most popular -- with 799 views and some 125 comments. No doubt it generated that many comments because I had a huge giveaway associated with it. Please note: I am editing the post. The blog candy is no longer available and congratulations to the winner. However, many of the things listed are still my favorite things -- and I hope to do that sort of giveaway again in the future! Sadly, I've also edited out the blog post of a few of the retailers who once sold the products I listed. One went out of business when it could no longer handle the large demand versus their everyday life -- that is good news of sorts. Their company was sold. Another went out of business when it was discovered the owner was STEALING the product from the manufacturer and re-selling it to unwitting customers at a huge discount (and a huge profit for him, since he paid nothing for it). Legal recourse has been taken against that person; I believe he is still in jail. 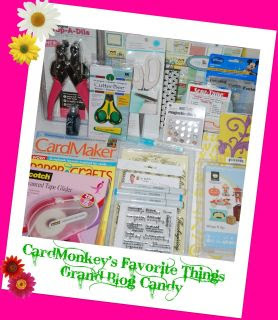 When one of my very favorite blogger friends DENA JONES invited me to join the "Our Favorite Things Blog Candy Extravaganza", I immediately started thinking of what are my favorite things that I use in my craft room. I know this is an unusual "take" on the assignment. Some bloggers are posting about their favorite people, favorite techniques, favorite cards or layouts that they used. It must be saying something about me that my mind went instantly to shopping!!! I started assembling my giveaway, and it started growing bigger and bigger ... and this post has gotten longer and longer in the months we've had to prepare. So without further ado, let me FIRST show you my fabulous giveaway prize that will be going to ONE lucky CardMonkey follower who leaves a comment below this weekend! (Please be SURE you are a follower on Google Friend Connect -- it's how I check to be sure you're a follower. If instead you get my posts by e-mail or some other way, PLEASE tell me so in your comment). Good value: Use a 40 or 50% off coupon at a major retailer, like Michael's or AC Moore. 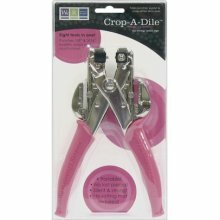 Crop-A-Dile: Made by We R Memory Keepers, a Crop-A-Dile is a tool that allows you to set eyelets and grommets, and also hole punch. There are versions available that are handheld, as well as those known as the "Big Bite" that are larger (for table-top use) and have a longer reach. I prefer the Big Bite because my hands are old and arthritic, but the picture here is that of the handheld version. MSRP: From $18 to $40. Good value: Hunt one down on eBay, for about half the retail value, or use a coupon at a major retailer. HoneyBee Crafting Scissors: For most of my fussy cutting, I need very small, very fine cutting scissors with super-sharp points. I love how these feel in the hand. 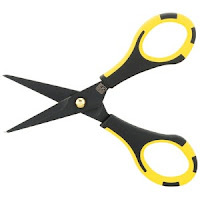 They're made by CutterBee, which is a division of EK Success. They're available in most crafting stores with an MSRP of $6.99. 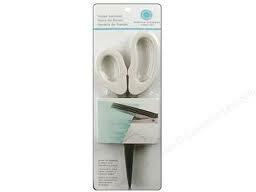 I also like the Close to My Heart Micro-Tip Scissors (MSRP $9.95). Good value: Best to buy these at a major retailer like Michael's, using a coupon. Good value: Amazon.com currently has them listed for $10.07, with free shipping if you're a member of Amazon Prime. Get a free trial of Prime, too! 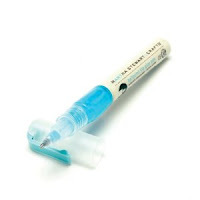 Martha Stewart Fine Ball-Tip Glue Pen: While I'm speaking about the crafting Diva, let me say I can't live without my MS glue pens! They're a little tricky to figure out at first -- exert some pressure at the flexible glue well while laying down the glue, and you'll be just fine! I use it for EVERYTHING! Good value: Go directly to Martha Stewart Crafts' website by clicking this link. She sells these babies for $3.19 each and they're in stock. Remember, coupons don't always apply to MS craft items. SookWang Scor-Tape: So now I'm stuck on adhesive -- oops, pardon the pun. Sometimes I crack myself up! ♥ For very strong hold especially on things like rosettes and boxes and such, you should use a good double-sided tape. My favorite is by SookWang Scor-Tape, distributed by Scor-Pal. It is a premium, double-sided, super-sticky, acid-free adhesive tape that's heat resistant. This means it will not lift up or curl when heated. Use it with many different media: glitter, embossing powder, foil, microbeads, flock, on chipboard, matboard, foamcore and more! It comes in all sorts of widths. My favorite to keep on hand are 1/8" (perfect for adhering thin strands of ribbon), 1/4" and 1/2" (best for those 3-D projects you see that I love!). Comes in rolls of 27 yards, all the way up to 4.5" wide! MSRP: $4 (1/8") to $50 (4.5"), and everything in between. 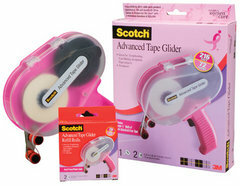 Good value: The "official" distributor of Scor-Tape is Scor-Pal, and here's the link. However, you can generally find many on-line retailers who have it for about 10-15% less. E-bay is NOT a good place to buy this ... I haven't found any discounts on this genuine tape there. 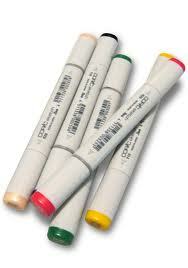 Good value: Hands down, the best place to buy Sketch Copic Markers is from Terri Olsen at Stamps Alive! Terri's regular discount price on Copics is $4.20 each plus shipping -- a huge reduction in the MSRP of $6.99. P.S. Congratulations, Terri, on the birth of your new baby Grandson!! White Gelly Pen: I've tried them all, really I have. For terrific faux stitching on your cards or layouts, or to add accent dots or "eyelights" to your Create a Critters' eyes, use a White Gelly Pen. Good value: I buy these at Michael's. I stock up when I have a 20% off your entire purchase, since they're just not pricey enough to waste a perfectly good 40% one item coupon. Waltzingmouse Stamps: Their Autumn-Winter sentiment set is crazy-versatile. Check out their other brilliant designs, too. K Andrews Designs: Kristal's "Positive Thoughts" sentiment collection resonates with me, and I've used it often. 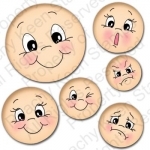 Peachy Keen Stamps: Called "PKS" on most crafty circles, this company has a wonderful selection, but it is most famous for their face stamps. Try the "Everyday Faces" or even Corny faces to add fun to even inanimate objects. Good value: Occasionally you can find these used on the Internet, such as on one of my favorite Facebook Groups called "~Get It Sold~". Otherwise, MSRP is in the $20 range for each of these sets. Digi-Stamps: I am a digi-stampin' fool! I love designs by Heather Ellis (particularly her Pure Innocence line) and MelJen Designs. Good value: Digi-stamps are a GREAT value no matter where you purchase them, and you'll typically have to go directly to the source for them. You can reuse, resize, reprint and use them as often as you wish, of course, honoring the company's Angel Policy not to redistribute or sell them other than a product (e.g., card) you make with them. Cutting My Designs: I first got into papercrafting after my dear daughter Emily asked for a CRICUT for Christmas 2008. I had no idea what that was, but as soon as I found out, I bought one for "her" ... and then had to have one for myself. I planned to cut fabric with it, as I was "into" sewing appliques. True confession: I gave up sewing when I saw how much fun it is to work with paper ...and six months later I started blogging about it. Since then, I've bought more than 120 cartridges, and growing strong. My favorite Cricut cartridge -- my go-to -- is CAKE BASICS. And no, I don't decorate cakes with it. It has a TON of basic shapes and images that I'm always using. I keep it at my left hand at the Cricut station at all times. My favorite NEW Cartridge is "ART PHILOSOPHY", a Close to My Heart exclusive. OMG, what wonderful images there are on that -- so versatile for every occasion! 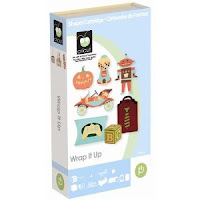 Another favorite is "WRAP IT UP" since I can cut shaped cards, packages and sentiments for just about every celebration. Again...versatility PLUS! Good value: I've never been disappointed buying Cricut cartridges on E-Bay. Be careful though, if you're wanting the Cricut Reward Points and to be able to link up your cartridge to Cricut Craft Room or your Gypsy. Make sure you're buying NIB (New in Box). A favorite retailer there is "Proud Parents", who also sell online as www.cricutmachine.com. Cheery Lynn Designs Dies: Having acquired so many Cricut dies, I couldn't imagine why I'd ever want to get into collecting dies to cut on my Big Kick or Cuttlebug. But once you experience the intricate designs now available in dies by several different die manufacturers, you'll be hooked like I am. There's no way to reliably produce such intricate wafer-thin designs on a Cricut. My very favorite thin metal designs are produced by Cheery Lynn Designs! Paper: I'm a stickler for paper quality since I invest so much love into making my cards and other paper projects. Two lines are consistently My Favorites both for design and paper quality ("hand", thickness, etc.). Those are Nikki Sivils Scrapbooker LLC, and Bella Boulevard. I have an Iris box full of NSS papers, which I turn to regularly to stimulate my creativity when designing a card. GEEZ!!! I can't believe I missed this entirely in my main features list, since I use it ALLLLL the time ... STICKLES!!!! I have them in every color available. I'm giving away one large bottle in my blog candy, too! USPS online shipping of Priority Packages - 15% discount! A Winner has been announced and it's SUZANNE ROSEBERRY! Congratulations! To others, thank you for playing along. All comments are still welcome, but you will not qualify for this blog candy any longer. Thanks for stopping by! And Good Luck!! Still a relevant post and VERY interesting, thank you.